We have a mouse in the house. A very small, kind of cute mouse. It’s in the downstairs area, where my writing room is located. This mouse appears to like my writing room. Maybe it fancies itself as the next Franz Kafka and is using my computer to write Metamorphosis II. Or maybe it’s just hungry; I tend to eat at my desk and I tend to be a messy eater, and I’m sure there is a week’s supply of crumbs beneath my chair. I’m ashamed to admit it but this teeny, weeny mouse scares me. Which is odd because I’m not normally squeamish. 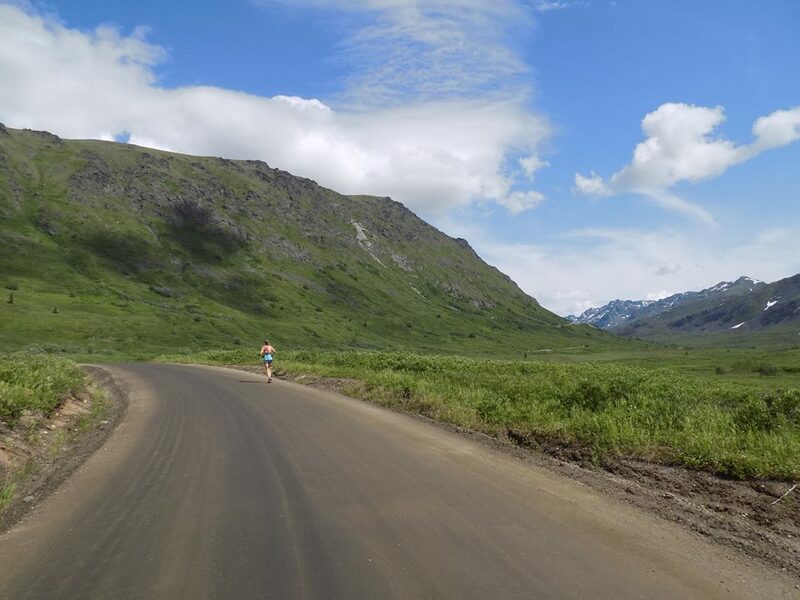 I’m not afraid of spiders, snakes or other creepy-crawlies, and even though I’ve been charged by bears and moose, it hasn’t stopped me from trail running. Yet I’m afraid of a damned mouse. My partner was away on a hiking trip all weekend, and even though I spent some of that time running 28 miles (in two separate runs) on fairly isolated trails by myself, I was too afraid to venture down to my writing room. Because of a damned mouse! And so I wrote in the living room while watching Orange is the New Black, Season Two. Needless to say, it wasn’t the most productive weekend, writing-wise. Fear is an odd thing, isn’t it? It’s so subjective and illogical. We don’t ask to be afraid of certain things, and yet we are. In a sense, it’s a bit like love. And what I love, love, love is the summertime and the mountains and being in the mountains in the summertime. 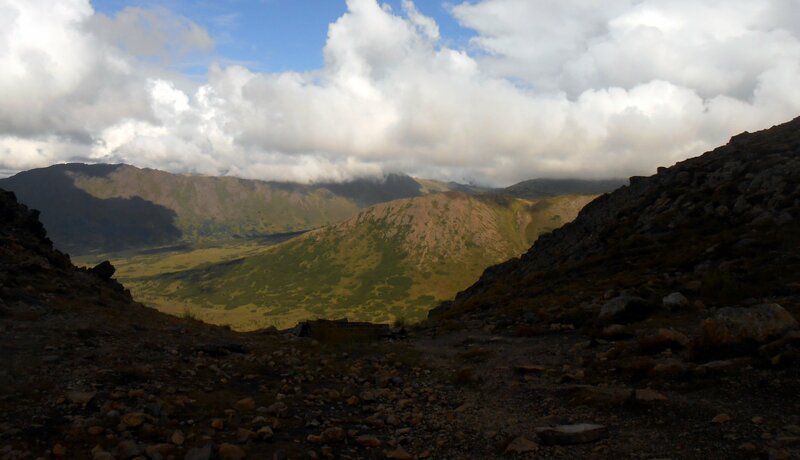 Last week Seriously and I hiked up Flattop, one of Anchorage’s most popular mountains. I only climb it late in the evening, to avoid the crowds because really, what’s the sense of hiking when there are people in front of and behind you? 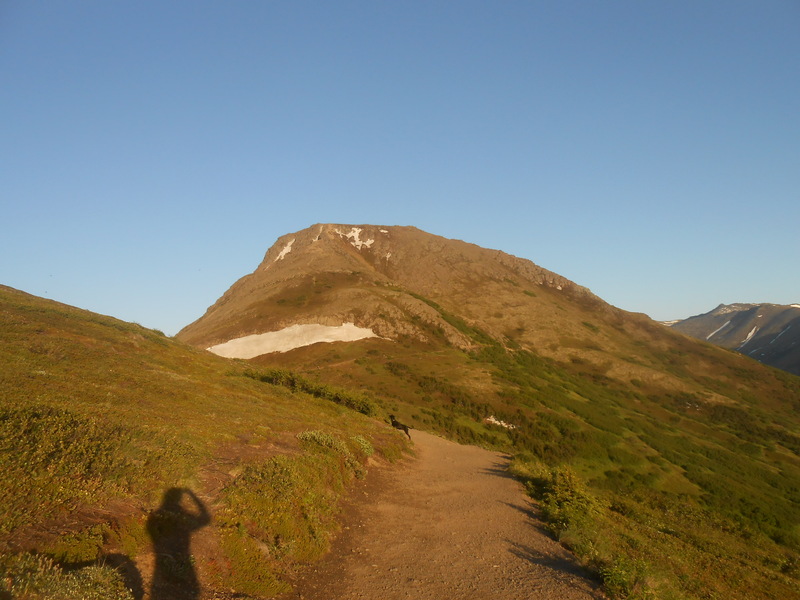 Approaching Flattop Peak from Blueberry Hill Trail. We got there around 10 p.m. and got back to the car around 11:30 p.m. and of course it was still light. 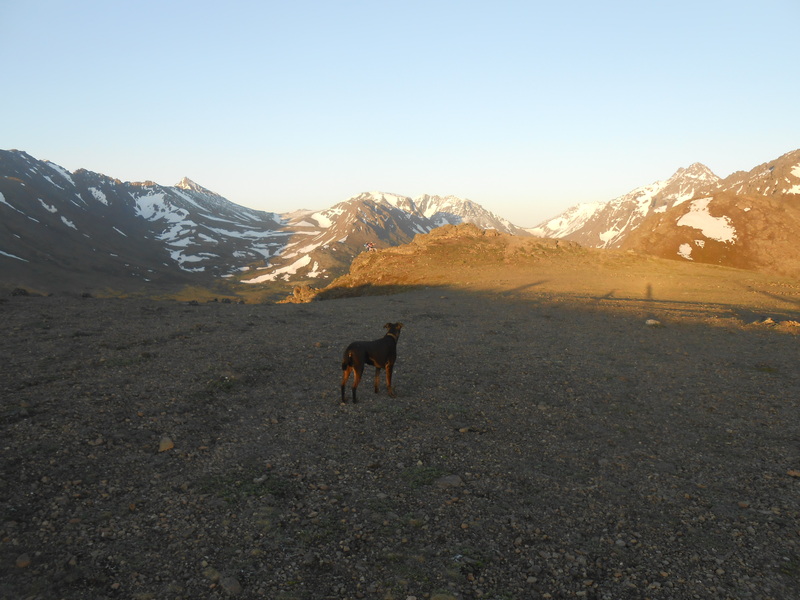 It seems odd to think that while most people sleep, I’m running down a mountain trail with the dog in broad twilight. 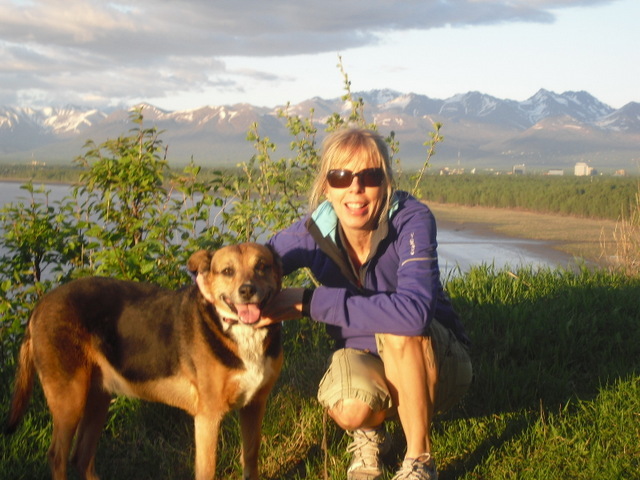 Oh, Alaska, how I love thee in the summertime. 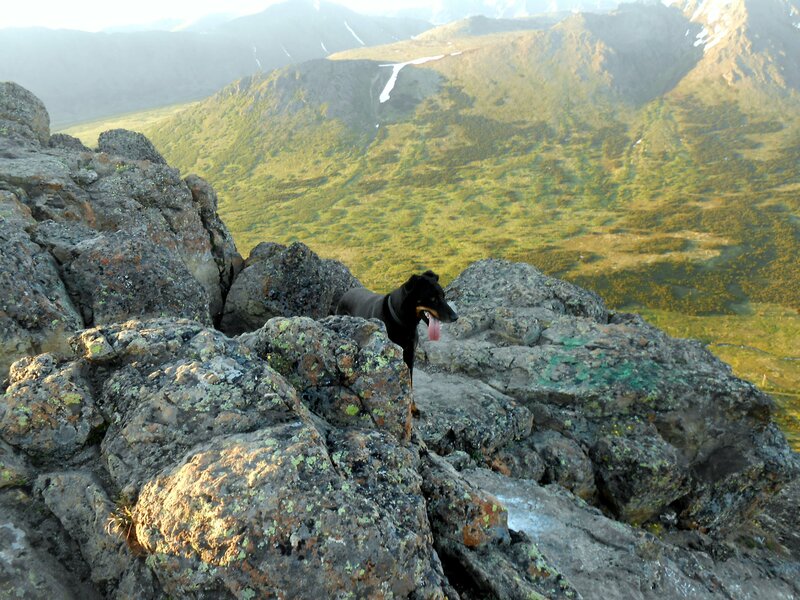 Seriously on top of Flattop, no one else around (the way we like it, hee, hee). Seriously looking out over the valley. Another view of the valley. See those telephone poles down there, and the slice of a path? 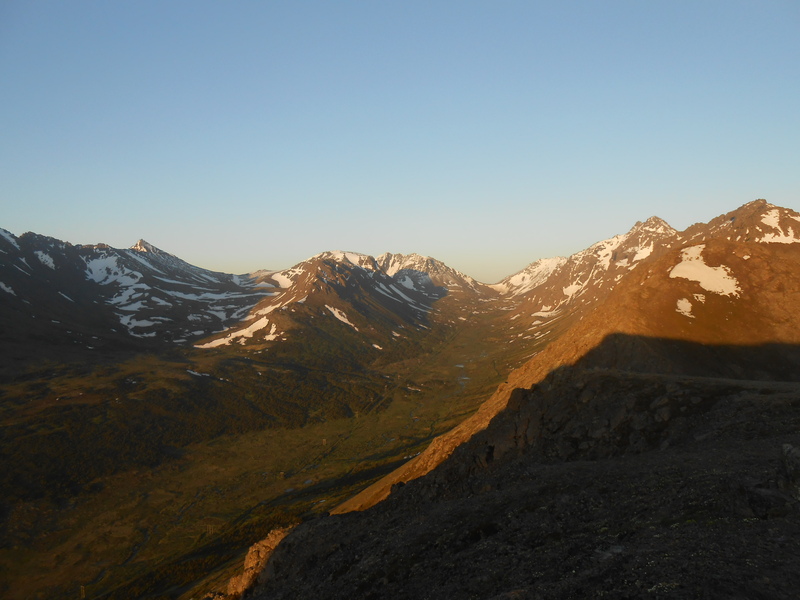 There’s Powerline Pass trail. It goes all the up the pass and then to Indian. It’s one of my favorite trails to run. In other news, I’m between books. Anyone know of any good reads? I’ve love some suggestions–thanks! Readingwise, have you read “Outline” by Rachel Cusk yet? I loved it. A different approach to storytelling. Cool, thanks so much for the book tip. I can’t wait to read “Outline.” And since it’s light most of the night, I’m up late, late, late (too embarrassingly late to actually confess here). I usually take a nap when I get home from work and then go out and hit the trails later in the evening. It’s a maniac lifestyle but since it only lasts a few months, it’s well worth it. Cheers and have a great week. I love how you’re not afraid to hike “alone” but are afraid of a little mouse. hah Or maybe hiking is more dangerous here? Last week 6 people died hiking (from the heat), and who knows how many were confronted by rattlesnakes . . . .
OMG, six people have died while hiking? I heard that it’s hot down there, close to 115 or maybe even higher. Can’t imagine that kind of heat. What scares me most about the desert is the threat of a mountain lion. When I’m down there running or hiking, I always imagine being pounced from behind. It’s a delicious kind of fear, though I’ve never seen one, have you? Cheers and stay cool. P.S. I’ll send some of Alaska’s clouds your way, okay? Yes, clouds would help. Tucson had some clouds the other day, but Phoenix NO. In my yard I get coyotes the size of German Shepherds and bob cats the size of . . . bob cats. Javelinas, snakes, scorpions, and then cute bunnies and lizards and quail and songbirds. It got up to 118 at Casa Castle. I hiked along a new trail this past weekend. In the foothills, along the South Fork of the American River. I don’t know why I did this because I have never thought about mountain lions before when I go off on my river walks, but the day before the hike, I suddenly thought “what if I come across a mountain lion” or better yet “what if a mountain lion comes across me”? I had to go to google to find out what I should do if I did. I was sooooo convinced it was going to happen on this new trail. Sadly, no mountain lion. As for your post … I think you need to give the mouse a name to take the fear away. And your pictures. I always think, while I’m on my hikes, that I’m so lucky to be able to see what I’m seeing. And then I realize that there are probably hundreds, if not thousands, of places in the world that are just as beautiful. If not more so. Your pictures prove it. How lucky you are! 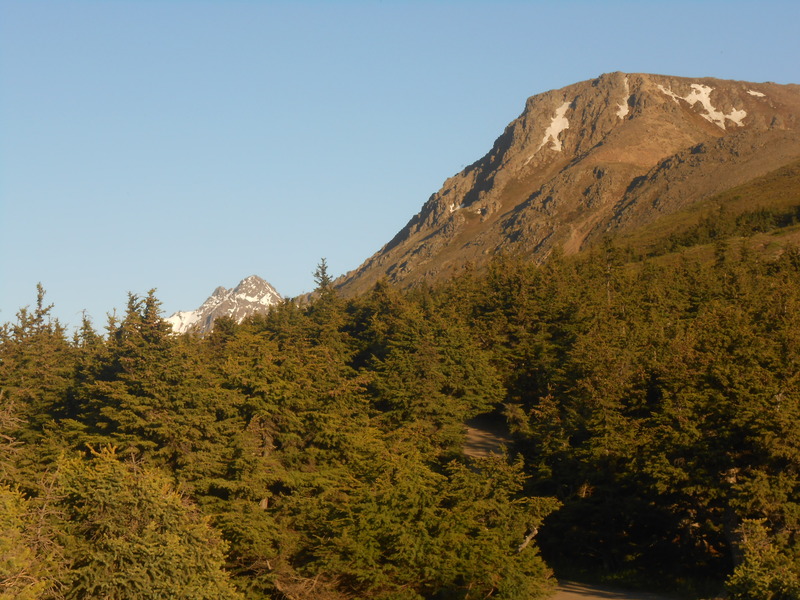 Mark: You’ll soon see all the wonders of Alaska, and you’ll be lucky, too. (Don’t worry, I haven’t forgotten about hiking/restaurant suggestions. It’s all coming soon.) There are so many, many beautiful places. I think we tend to forget this sometimes. Heck, I found beautiful places when I was at my sister’s in Philly. In the city! Never expected that. I love your mountain lion story. Maybe you passed one without even realizing it. They are very elusive, aren’t they? Did you read that if you’re wearing sunglasses you’re supposed to take them off and stare at the cat straight in the eye? I guess it’s seen as a challenge and can prevent a pounce. I would love to see one but hopefully not up close and personal. Cheers and have a great week. We’ve booked a couple of “excursions.” We’re going to the Mendenhall glacier when we’re in Juneau and we’re going to the raptor center — don’t remember if that’s in Sitka or Ketchikan. I don’t need your help imagining that I may have passed a mountain lion without knowing it! Thank you very much. What I read is that you should stare them in the eye, make a lot of noise, and make yourself as big as possible. I think you should change one letter and pretend your mouse is one of your friendly neighborhood moose. Oh, thanks, Julie, I can’t wait to read “The Tale of Despereaux.” I love YA books, and it will surely give me a different perspective on the mouse situation. Probably, I will end up trying to befriend the mouse as yet another pet. Hope your week is going well, and that you’re all enjoying the summer. Cheers and big hugs. 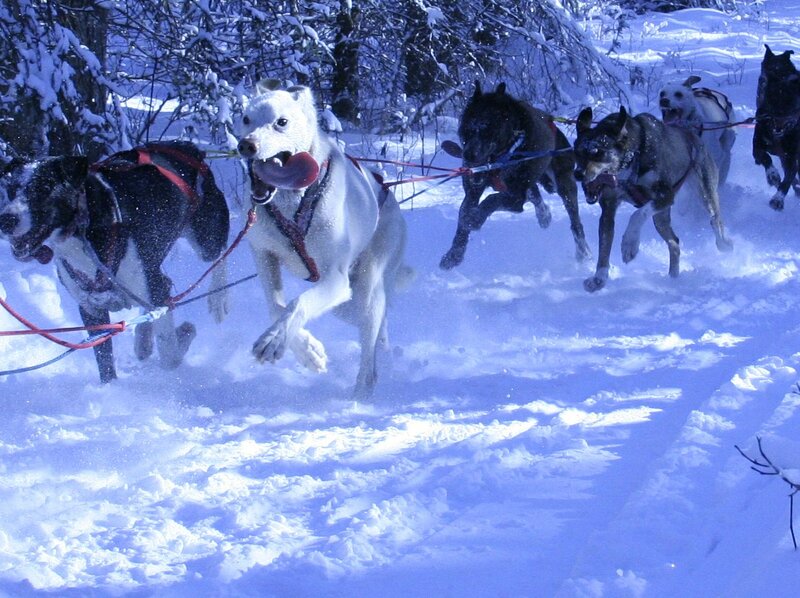 At my cabin up North I have ‘small’ visitors frequently but I have a dog and most visitors disappear… so to me its simple math… you have a dog and a mouse, have the dog remove the mouse. Hee, hee, Pete, I wish the dog was a good mouser. She seems to have little interest (maybe too many doggy biscuits?). Hope you’re enjoying the hotter temps up there. What a summer, eh? Cheers and take care. Mark has a good idea: name the mouse and make it part of the family 😉 That should take away some of the fear. I love that you’re not afraid to go running by yourself … although you must feel safer having Seriously with you. 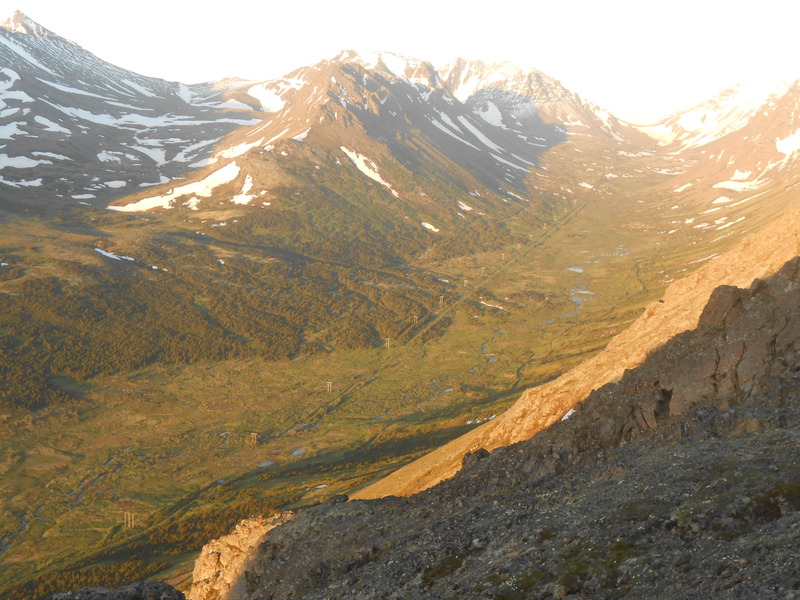 I’m surprised that not more people go running and hiking at twilight … it looks so beautiful. I know it’s late and I suppose people are trying to maintain a regular schedule, but I think, I’d be like you: it’s only for a few months so go manic!